Microtel Inn Baguio my Baguio home. Microtel Inn Baguio with the fresh smell of brewed coffee. The Microtel Inn Baguio is in the famed cleanest and greenest city in the Philippines, Baguio, which is nestled on top of a 1,500-meter high plateau in the Cordillera Mountain range of northern Luzon. This warm people-filled community, having an area of 49 square kilometers of prime property, is highly urbanized. Crisp pine-scented air, clear blue morning skies and galloping horses on romantic foggy hills are things which come to mind when thinking of Baguio. I arrived from Victory Liner’s recently renovated and modernized bus terminal, the nearest hotel you can find is the Microtel Inn & Suites. It stands on top of a hill right beside the bus station, very convenient. There is even a connecting passageway from the Microtel Inn Baguio to the terminal, I guess it must have been made to order for Victory Liner’s passengers. A thought passed through me that even if I already had a prior reservation made at another hotel elsewhere, this lovely inn wouldn’t be hard to fall in love with. It has a country-style type of exterior which you could call picture perfect. Pine trees also prettily adorn the outside landscape, making it look like a stately Georgian house, looking so manicured, brand new and clean, void of any trace of dirt. Upon entering, the more did I feel that I truly was at home. The hotel staff had that signature warmth, excellent service, all friendly and accommodating, from the guard to the front desk to bellhops and housekeeping. As I entered the lobby I could smell the authentic Benguet coffee being brewed for the hotel guests, nothing like a heart starter early in the morning. Each room includes a coloured TV with cable channels, multi-function telephone with IDD and NDD services, toilet and shower with hot and cold water, a refrigerator with basic mini-bar items and even a window seating area for relaxation. It also has complimentary breakfast available on request (though it tended to be greasy and cold for my taste). For the modern day traveler, you can hook up your laptop to an internet-ready data port inside the room; though the per hour rates are quite pricey, about four times more expensive on average as compared to internet café per hour rates outside. If you have a bigger budget, the Suite Rooms have a kitchenette that includes coffee and tea making facilities, a microwave oven, a counter with sink and a sofa bed for extra people. 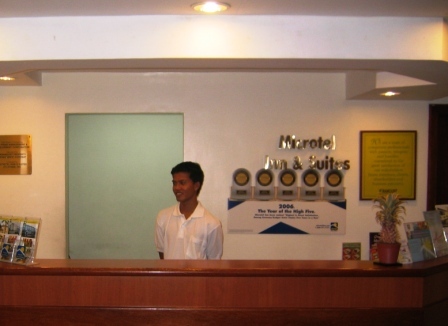 Microtel Inn & Suites Baguio also provides business travelers with basic yet necessary facilities such as a meeting room that sit a maximum of 20 people, complete with photocopier, facsimile, and mailing services. I also noticed that there is ample parking space for you if you bring your own car up to Baguio. Inside and out, presence of security guards is always seen. Your room keys are also of the electronic-key card variety. Is the Microtel Inn & Suites Baguio worth the money? Excited to further explore the prime tourist destinations in the city, I was happy with my decision to stay at the the Microtel Inn Baguio. It is near the commercial artery of the city – Session Road, Burnham Park, Shoe Mart (SM) to name a few. How much will it cost at Microtel Inn Baguio? 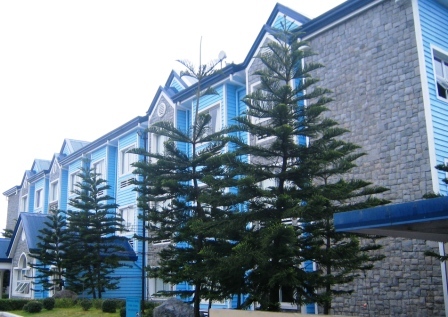 Have YOU stayed at the Microtel Inn Baguio? Share your tip or review on the Microtel Inn Baguio with everyone!